Near the end of a four-month stay in Japan during summer 2014, Kathryn “Katie” Chepiga 18PhD hiked up Mount Fuji. An Emory graduate student of organic chemistry, Chepiga was immersed in an international research project through an exchange program of the National Science Foundation’s Center for Selective C-H Functionalization (CCHF). She and her Japanese counterpart at Nagoya University had made a significant finding involving a new method of organic synthesis. Now she wanted to cap her experience abroad by summiting Fuji, Japan’s highest mountain and an active volcano. “It was really cold, rainy, and foggy. We couldn’t see more than a few feet ahead of us,” Chepiga says of the first eight-hour leg of the hike. She was accompanied by Emory senior Michael Wade Wolfe 15C, who had recently arrived in Japan as part of the same CCHF exchange program. The lack of visibility made all the pain and effort of hiking up one of the world’s most scenic peaks seem like a futile exercise. Soggy and freezing, they trudged on until they made it to a hiker’s communal way station where they could change into dry gear and get a few hours of sleep. Summiting Fuji was a walk in the park compared to the CCHF research that took Chepiga to Japan. 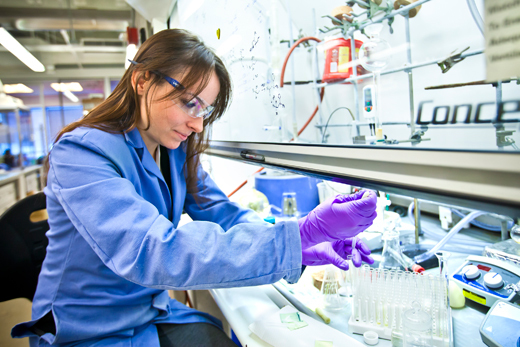 She joined forces with Atsushi Yamaguchi, a graduate student from Nagoya University, to demonstrate how a newer, more efficient strategy can be applied to synthesize natural compounds that hold potential medicinal benefits.